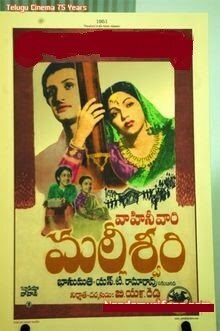 Malliswari is a 1951 Telugu musical film directed by B.N.Reddi. This film is based on Buchi Babu’s radio play Rayala Karunakrutyam.B.N.Reddy recalls: "When I went to Hampi to shoot my first film Vande Mataram in 1939, I was deeply attracted to Sri Krishna Devarayalu. I wanted to make a film on Sri Krishna Devaraya. Years passed by. But I could not get the right story. Fortunately, Malliswari happened. I think it is the best movie I have directed".